The image above is that of ‘pericoronitis’….I realize that it’s not the most pleasant image, however, it is a common entity that is seen in many mouths…so quite worthy of discussion. 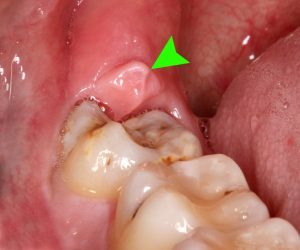 Operculum: This is a flap of soft tissue that covers a partially erupted tooth (as seen in the above image). Pericoronitis: The area under the operculum is quite difficult to keep clean, thus often a site where food and plaque debris accumulate. If the debris is not removed, then it easily results in inflammation or an infection. This is known as Pericoronitis. 1) Is most frequently seen at the site of a partially erupted lower third molar (wisdom tooth). It usually occurs in young adults when the wisdom tooth erupts (age 15-24) into the mouth. For more information about wisdom teeth, please scroll through the services section of my web site. In a healthy scenario, the opposing third molar tooth (in the upper arch), erupts into the mouth with a pointy cusp tip. This is generally the case with all of the back molar teeth. However, these pointy cusps flatten and smooth out over time because the teeth in the opposing arches contact one another. An unhealthy scenario resulting in Pericoronitis is as follows: If the lower third molar is partially impacted, it means that it does not erupt into the mouth (it is submerged). In these situations, it is not uncommon to see the upper third molar grow downwards as it wants to contact the lower tooth. So, it may continue to grow down until it makes contact with the gum tissue of the Operculum. This causes the Operculum to become irritated, often resulting in inflammation and Pericoronitis. 1) Chronic Periocoronitis: This is a state in which there is continuous inflammation and most often a chronic infection underneath the operculum. This chronic state may appear with few symptoms if any, however, it usually escalates into an acute condition. It can stay chronic for a long period of time before becoming acute. Chronic inflammation results in destruction of the oral tissues (gum and boney attachments) over time. As mentioned, chronic situations often becomes acute. This will present as intense pain, pus and an associated abscess (accumulation of pus)…it is at this point that many individuals seek help…some don’t even know that there is an issue when the problem is chronic. The problem is also frequently cyclical going from chronic to acute back to chronic etc. And while all of this is going on, more and more destruction of the gums and bone supporting the teeth is occurring. For this reason, it is important to seek treatment early on. If the patient can’t identify that there is a problem, then the dentist or dental hygienist should be able to do so. This is why regular dental checkups and cleanings are important. There is a range of severity that can occur regarding the destruction of the oral tissues during the chronic-acute cyclical process….we will look at this in the next blog.